My order arrived today from the lovely Lil Kawaii Mermaid on Etsy! 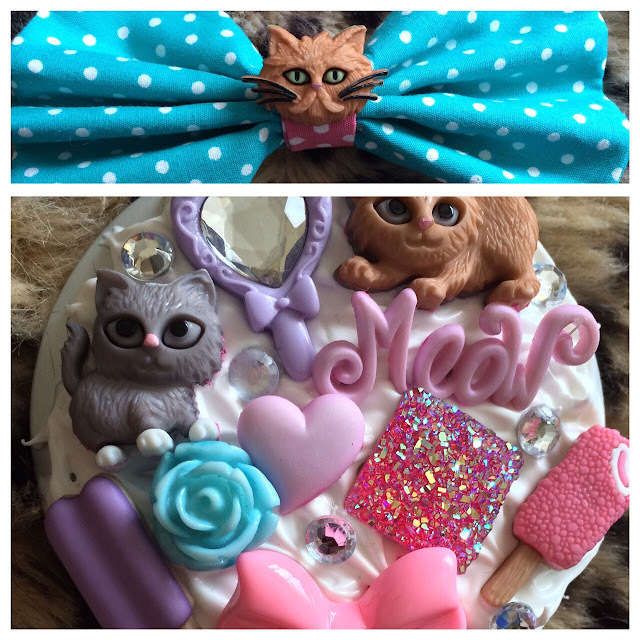 This shop mainly sells decoden compact mirrors and phone cases. It also sells hair bows and little charms. So my order arrived today in pretty packaging, and it's just lovely. These are my lovely items. They're kitty themed because I loove cats! The cat on the bow looks like a ginger version of grumpy cat - aww! Seriously these are so cyoote, the mirror is really great quality too, it has a magnetic closure which is cool. The alligator clip on the back of the bow is lovely and sturdy which is worth noting. Definitely check out Lil Kawaii Mermaid if you like cute little decoden creations. I'm pleased with my items and I'm sure you will be too!